Cool, clear water." Oh, no. Will we all be wailing that famous old song before the decade is out? Not to put too fine a point on it, yes, folk, we may very well be doing that. But by then, we'll be wasting our breath. 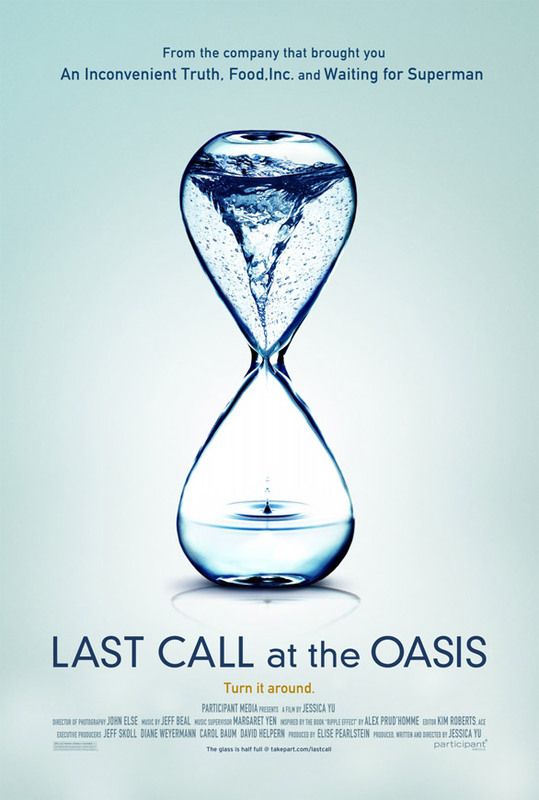 If Jessica Yu's new documentary LAST CALL AT THE OASIS is to be believed, the disappearance and destruction of our potable water is an ongoing crisis that nobody seems to want to hear about or talk about. I recently came back to New York City from Southern California, the latter being, according to Ms Yu's film, a prime target for water shortages. I didn't hear anyone there say anything about the problem. Certainly no one wanted to talk about it -- or brought it up unless I did first. And then they sounded suspicious. "Really? Well, when? And why? And how do you know?" Those questions are well answered by Ms Yu, shown at right, and her crew. Her film, in its opening credits, features some of the most beautiful, and maybe original, shots of water that I've ever seen. 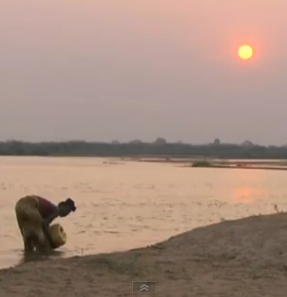 Water, we are told up front, is the new oil -- and the next epic crisis. It's hitting Australia now; California soon. The talking heads in this movie -- which include the likes of Erin Brockovich (shown below), Tyrone Hayes, Jay Famiglietti and Peter H. Gleick -- sit atop energetic bodies that are working for the cause of saving water, our environment and our citizens. This adds to the energy of the movie, and while it slants the film toward its own cause, why not? 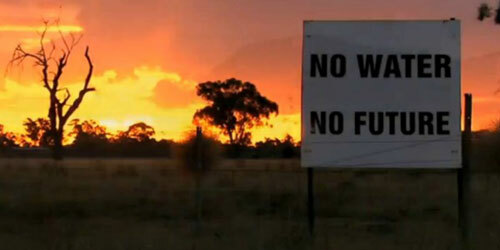 The point is to call attention, and from this create action, regarding the coming water crisis. 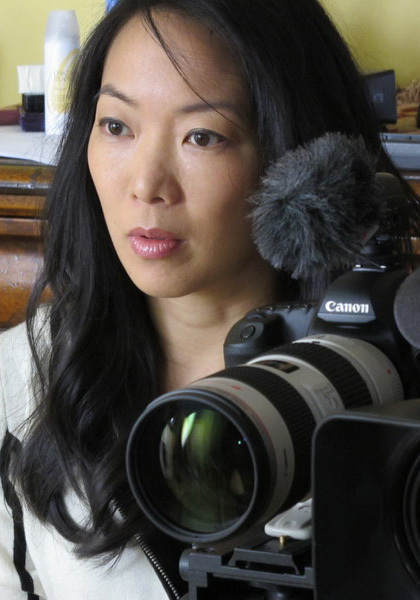 Ms Yu appraoches water from many different angles, each of them appropriate and vital -- from violations of our Clean Water Act to the toxic chemicals that are killing and maiming our citizens, from what went on during the Bush-Cheney regime to the increasing plight of our amphibian life forms, from the near-worthless EPA to the upcoming "water wars," in which the third world is bound to lose most heavily. One of the most interesting, effective, and humorous sections of the film has to do with bottled water and its supposed safety (above). Even better is the portion dealing with drinkable sewage water and how to market it. "How do you get people to wear Hitler's sweater?" asks one of our talking heads. "You put it on Mother Teresa!" he advises. Another in the increasing array of what I am now calling end-of-times documentaries, this movie may scare you to death, but it'll also entertain you and make you think. And maybe even rouse you to action. 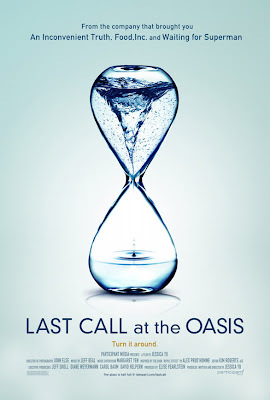 Last Call at the Oasis opens today, Friday, May 4, in New York City at the Lincoln Plaza Cinema and the Landmark Sunshine Cinema, and in Los Angeles at The Landmark. Another dozen cities across the USA will be seeing it soon; click here to see a listing of playdates, including theaters and cities.